The Imo State Police Command has apprehended a 19-year old girl, Chidimma Nwoke and a 40-year-old bus driver with Peace Mass Transport Company, Samuel Nkemjika for allegedly taking part in kidnapping and armed robbery activities. The state commissioner of police, Chris Ezike told Punch correspondent that the bus driver, an indigene of Bende Local Government Area in Abia State who used his bus in abducting his victims was arrested in Onitsha, Anambra State. Nkemjika who confessed to the crime,said he got N200,000 from the N2m ransom which his gang made from their kidnap operations . In another development, 19-year-old girl, Nwoke, a native of Umuaka in Njaba Local Government Area of the state was nabbed by the operatives of the command together with her two male gang members . Ezike disclosed that the gang was notorious and specialised in robbing motorcyclists and traders at gun point. Ezike said that luck ran against the gang when they robbed a victim which forced the police to swing into action and arrested the three-man gang, immediately. He said that the two motorcycles which the gang used in robbing their victims, one locally made shot gun with three live cartridges were recovered as exhibits from the gang. Ezike asserted that his command had tightened all loopholes, adding that the major reshuffle he made at the command recently was yielding positive results. 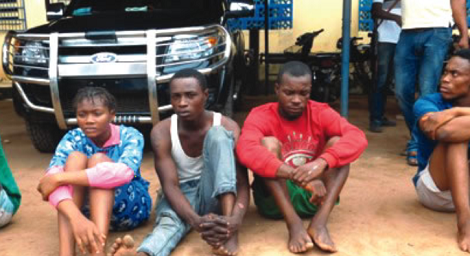 The female robber said that she had got N45,000 from her gang in five operations.